On the outside, this little fellow is completely devoid of color, on the inside, he's busting at the seams. Given his surroundings, how could he not be? 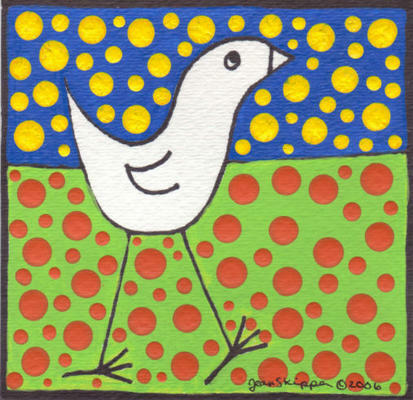 I hope this little piece of polka-dot whimsy brightens your day too. The base of this piece 140 lb watercolor paper that's been painted with artist quality acrylic paints and ink. It's been handsigned; it comes with a certificate of authenticity; and it will be shipped in a clear protective sleeve. The back will also be personalized upon request.